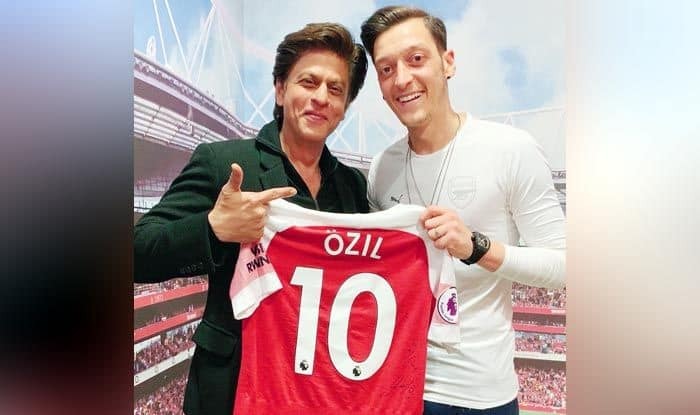 Bollywood superstar Shah Rukh Khan took time off to watch a football match featuring Premier League clubs Arsenal and Newcastle, where he spent some time with German footballer Mesut Ozil. Bollywood superstar Shah Rukh Khan took time off his hectic schedule to visit Premier League club Arsenal take on Newcastle United at the Emirates Stadium in London on Monday evening. The actor, whose latest movie release was ‘Zero’, witnessed the match where Arsenal displayed a clinical performance to defeat their opponents 2-0. After the match, SRK met popular German footballer Mesut Ozil and his fiancée, Swedish model-actor Amine Gulse. The actor took to social media to share his pictures with the footballer: “What a lovely evening @Arsenal congratulations. Thx @MesutOzil1088 & #AmineGulse for your warmth love & hospitality. See u guys soon in India.” With the victory, the Unai emery-led Arsenal leapfrogged rival clubs Manchester United and Tottenham Hotspur to take the third spot in the league table. Shah Rukh Khan is admittedly a keen football follower and also actively posted on social media during the FIFA World Cup tournament which took place in 2018. Arsenal, the London-based club, is one of the most popular football teams in the world and other Bollywood stars, in particular Ranveer Singh is a huge Arsenal fan. Popular Indian actors and celebrities who pledge their alliance with the club are Alia Bhatt, Deepika Padukone, Disha Patani, Esha Gupta, popular cricket commentator Harsha Bhogle among others. The match against Newcastle was special for more than one reason for the Arsenal fans as the club recorded their tenth straight home victory which effectively puts them on the right track with their hopes of Champions League qualification. Midfielder Aaron Ramsey had opened the scoring for the club in the first half which was later capitalized in the second half by French striker Alexandre Lacazette. Arsenal will now take on Everton on Sunday following which they will turn their focus to Napoli in the Europa League on 11th April.